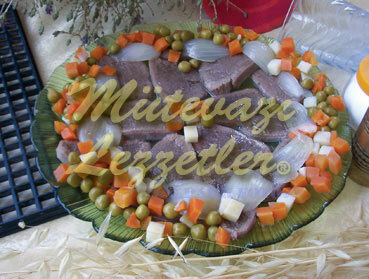 # Place the ox tongue into the pressure cooker, and add the carrot and onion which were cut into a few pieces, salt and black pepper. # Add 3 cups water, cook for 45 minutes after it starts to boil. # Peel the skin of the tongue while it is hot, slice into pieces which have small finger thickness, place the onion, carrot and potato near it. # Mix the flour, vegetable oil, 1 cup boiling water of tongue and 1/2 tsp salt and boil by stirring. # Pour this mixture all over the tongue while it is hot still. # Place the green peas on the edge of the tongue. Serve hot. Note: It is advised to cook the offal in pressure cooker for saving time and energy.